This is my revision for my "My Milk" recipe. There were quite a few issues I had with that recipe, though others said they really enjoyed it. Firstly, the inclusion of FW Fruity Flakes really bothered me. Even though it was only at,0.27%(or some ridiculous percentage like that), I didn't want any of that dangerous sugar crap in my recipe no matter how little was present. I don't mind diacetyl...but sugar? No way. Secondly, there was simply too much lemon in My Milk. Way too much. I mean...a lot. Did I say way too much? And finally, the correct balance with the custard & brown sugar just wasn't 'there'. Sure, it was palatable. But it wasn't worthy of all the praise it got, in my opinion. I've been reviewing the original recipe since its' inception and reformulating on paper over & over & over. Today(05/04/17) I think I finally perfected the flavor. I quickly mixed up a 40ml batch straight away. I'm weird like that. If it doesn't look right, I won't even waste my time or supplies mixing it up. Needless to say, I was very pleased with this revision. Even fresh, this just...rocks. Everything is more balanced than my first recipe. And the lemon doesn't dominate. 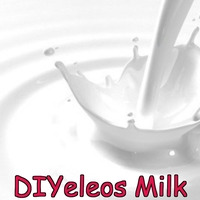 For those of you who want to enjoy Teleos The Milk without the SUPER inflated price, I think this mix is for you. This is one of those recipes that you just "know" will get better & better with age. Which is why I am releasing it right away. The 1st difference you will notice in this new recipe is the inclusion of TFA Berry Crunch(also called Berry Cereal). This is because the more I vaped on the original Teleos eliquid, I found myself tasting this. Its a weaker flavor than FW Fruit Rings, so in order to be tasted, it was necessary for this concentrate to be higher. ANY less, and it becomes invisible in FW Fruit Rings bold flavor. FW Fruit Rings is a great Pebbles foundation. At 1%, the citrus flavor(as in the real cereal) is present. CAP Lemon Meringue Pie was used at only 0.5% in order to 'soften' the sharp lemon in the FW Fruit Rings, while not completely killing the lemon. It also boosts the milky part of this mix. First off we have the tried & true FW Hazelnut/FA Meringue milk base. I used more Hazelnut than Meringue in order to bring out a slight malty cereal feel. I purposely avoided Acetyl Pyrazine because this is more of a 'leftover milk' recipe as opposed to a grainy cereal. I wanted more thickness & milkiness, which is why I included TFA Vanilla Swirl at a low 1.5%. For the original Teleos The Milk and this new recipe, TFA Brown Sugar and CAP Vanilla Custard v1 are a MUST. Vanilla Custard is prominent, yet balanced. You cannot have Teleos The Milk without custard or brown sugar. That's just a fact. The key is getting the balance right. My original recipe had the custard at 4%. But the way it was balanced(or UNbalanced) made it TOO prominent in my My Milk recipe. In this new version, I use CAP VCv1 at a HIGHER(6%) percentage. And yet, even though it's higher....it doesn't take over. NEWBS: Notice this when formulating a recipe. Depending on the % of the other concentrates, raising a particular concentrate's percentage doesn't necessarily make it taste stronger! It's all about the balance. EDIT: You can use either Erythritol OR CAP Super Sweet here. If you use Erythritol, use it at 0.75-1% depending on the sweetness you desire. This is just GREAT freshly mixed as I knew it would be, But, as with all milky cereal vapes, 7-14 days steep will benefit it greatly. 70%VG is the way to go for that milky 'feel'. Do not take it upon yourself to copy and publish this recipe over to ELR. THIS ACTION IS STRICTLY FORBIDDEN. Respect mixers, they are not your ticket to success...They are your friends. This recipe is the property of SixStrings952 and released under the CC Attribution-Noncommercial 4.0 license. You may not copy, derive or commercialize this recipe without following the terms of this license or the explicit permission of the creator. This is nostalgia for me! I must say this is 95% close to the original one. Beautiful recipe and thank you so much for sharing with us. Great job! Great recipe! never tried the original but I really like milky cereal vapes and this is a bomb! Thank you! This is a recipe I kept putting off to mix, I was over the whole cereal fad and didn't think I would enjoy this profile much anymore. Boy was I wrong! Very impressive recipe! I wouldve never thought to use 6% van custard, but everything in the mix just works so well. Great job on this one! Not only one of the best cereal vapes I've had in a while, but one of the best recipes period! Very impressed! It's been a while since I've vaped Teleos. For a few years, it was my favorite vape, but it smelled old and looked dirty, and eventually just tasted like bad milk with lemon . I just mixed this up today and it blew my mind how good and how close it is to the original. It does have some slight differences, but not much, and not enough that I would change this recipe. It's like getting a fresh bottle of Teleos. I've only had it one day, and I'll update my review in a week if anything changes. Update: Perfect. Absolutely amazing. I can't keep a bottle on my desk at work without everyone else stealing it, and ended up making a 16oz just so I wouldn't have to worry about running out. Amazing job, much better than the original. It's a new favorite at BCF! This is absolutely delicious!! Made 240ml and havent been able to put it down! Thank you for my new ADV!! I really enjoy The Milk and in my opinion this is super close in authenticity and the flavor is amazing! Great right off the bat and I would assume that the custard will develop with the rest of the flavors over some time. Not really needed IMO though. Delicious! This is a solid recipe. It's a very mild citrus cereal with thick cream. Never had the original, so I can't vouch for authenticity. The Brown Sugar really gives the recipe complexity. I love the way it sweetens the milk and gives a dark contrast to the bright lemon cereal. It's a very full and satisfying vape. I'll definitely be adding this to my regular rotation.